Patients are either ignoring their doctors or lying to them. Mothers are sneaking the stuff into their children's cups. Regulators are trying to control explosive growth. What has people so heated up over milk? VALERIE WALBEK IS A 28-YEAR-OLD NURSE practitioner at a Falmouth clinic who gives all her pregnant patients the same advice: Eat four daily servings of dairy products and by all means avoid any dairy that is unpasteurized. That's because the US Food and Drug Administration, the Centers for Disease Control, and the American Medical Association have warned for years that unpasteurized - or "raw" - milk and cheeses can carry listeria, a potentially deadly kind of bacteria, and other pathogens that are particularly threatening to pregnant women and their babies. But what Walbek doesn't tell her patients is that when she was pregnant with her first child last year, she drank gallons of unpasteurized milk. The milk is purchased from a Foxborough farm each week. With just a few notable exceptions - the midwife helping with the birth of her child, the Cape residents she shares milk pickup and delivery chores with, and her husband, Daniel Walbek, an engineer at Woods Hole Oceanographic Institution - she didn't confide in anyone, even though she considers the four obstetricians she works with in the Falmouth practice "all friends." "I have mentioned to them that I go to a farm for my milk, but not that it is raw, " she says. Until now, eight months after the birth of her daughter, Lucia, Walbek hadn't revealed this information publicly. "I'm a little new to talking about it," she says. Quietly - since the accepted medical and public health wisdom is that raw milk is a dangerous source of bacteria, including listeria, salmonella, and E. coli - hundreds of consumers around Boston have made the same decision. A total of 24 Massachusetts dairies now have permits to sell raw milk, double the number two years ago. Just Dairy, a buying club that delivers raw milk from central Massachusetts to Boston-area consumers, now drops off more than 250 gallons weekly around the metropolitan area, versus 25 gallons when it launched five years ago. Producers around the state say that raw milk is increasingly a sought-after product. Production is rising, though raw milk sells for as much as $8.50 a gallon, versus about $3.50 for pasteurized milk. Nationwide, it's difficult to know how many people regularly consume unpasteurized milk. Selling raw milk is illegal in 18 states, and in four others, it can be purchased only as pet food. But Sally Fallon, founding president of the Weston A. Price Foundation, a nonprofit advocacy and research group in Washington, D.C., estimates (based on her organization's analysis of CDC data) that about 500,000 Americans - about 5 percent of milk drinkers - regularly consume raw milk. The group believes that the number is growing exponentially. Until very recently, there was no such thing as "raw" milk; people have consumed milk straight from the cow for centuries. In the 1860s, French chemist and microbiologist Louis Pasteur discovered that bacteria and other harmful organisms contaminating beer or wine could be killed off by heat. The widespread pasteurization of milk starting in the 1920s "was one of the major breakthroughs in public health," says Eric Decker, a professor of food science at the University of Massachusetts Amherst. (There are several methods of pasteurizing milk before it is bottled; most commonly, its temperature is quickly raised to 161 degrees and kept there for 15 seconds.) Before pasteurization, drinking industrially produced milk in America was a gamble. In The Untold Story of Milk, Ron Schmid, a naturopathic physician and raw-milk advocate, writes that as city populations skyrocketed in the mid-1800s and pasture for cows in urban areas became scarce, dairies began feeding their cows waste grain from local distilleries. The cows quickly became diseased and emaciated, producing poor-quality milk that, coupled with inadequate sanitation and refrigeration, caused a host of health problems, mostly in young children, and created a scandal around the milk industry. Pasteurization was seen as a solution to what was known as the "milk problem." Walbek, the nurse in Falmouth, believes it is that history and those fears that are guiding medical opinion today. "The FDA is understandably cautious in its approach," she says, but as a result, it is also "just a little behind." SOME OF THE EVIDENCE WOULD SEEM TO back her up. The last cases of illness from raw milk recorded by the Massachusetts Department of Agricultural Resources occurred nine years ago, when 11 Boy Scouts visiting a farm became ill with salmonella after drinking raw milk; all recovered. Nationally, according to the Centers for Disease Control, from 1998 to 2005 there were 1,007 illnesses and two deaths from raw milk or cheese consumption - a tiny fraction of the estimated 76 million total cases of foodborne illnesses each year. And few foods are absolutely safe, including pasteurized milk. Massachusetts consumers found this out in December, when state public health officials revealed that three elderly men died from listeriosis they had contracted from pasteurized milk produced in Shrewsbury; a pregnant woman who contracted the illness had a miscarriage. Even the most ardent raw-milk proponents don't suggest giving up pasteurization altogether; most just want to be able to purchase raw milk and raw-milk products everywhere, legally. "We want the choice," Fallon says. Because of high levels of disease and low levels of cleanliness, she says, her organization doesn't recommend drinking unpasteurized milk from "confinement dairies" like the ones that supply most of the commercial milk on the market. As evidence, the group points to research data such as a 2002 study conducted by the USDA's National Animal Health Monitoring System of raw milk intended for pasteurization from 860 dairies around the country. The study found a type of listeria pathogenic to humans in 6.5 percent of the dairies, and salmonella in 2.7 percent of them. Farmers who produce raw milk intended for consumers say they employ much more careful sanitation procedures to protect against such levels of contamination. In addition to the new research, the trend is part of the broader buy-local food movement. Consumers shop at farms and farmers' markets to support local agriculture, but also to obtain foods thought to be more nutritious - harvested riper, not treated with hormones or pesticides, less processed - than what's available in many stores. In most states, Massachusetts included, unpasteurized milk cannot be sold in retail stores, or even at farmers' markets; it's only available directly from farms. There's another interesting theory, too. The wide gulf between raw-milk proponents and opponents is part of a growing "lack of trust in contemporary institutions," says Michael Bell, a professor of rural sociology at the University of Wisconsin in Madison, who has surveyed raw-milk consumers in the Midwest. Nina Planck, the New-York-based author of Real Food: What to Eat and Why, agrees. "The same divide applies to traditional and modern medicine," she says. But she adds the debate is really heating up over pasteurizing milk for emotional reasons: "It is a children's food. This always gets people excited." So excited that some of them defy medical advice. "My pediatrician is against us drinking raw milk at all," says Jennifer Klauder, a 30-year-old Chelsea mother of two who started drinking raw milk a few months after her first child was born. She and her husband, a computer consultant, had done plenty of research before they decided to start drinking unpasteurized milk, she says, and today, while her 10-month-old daughter doesn't drink it yet (she's still breast-feeding), her 3 1/2-year-old son does. "My family has chosen to take the risk." STEAM RISES FROM A LARGE VAT FILLED with plastic tubing and stainless-steel valves in an unheated former chicken coop not 2 miles from Gillette Stadium in Foxborough. Terri Lawton, owner and manager of Oake Knoll Ayrshires farm, is in her milk room, using hot water and special cleansers to wash, and rewash, milking equipment that she will haul 100 yards to an old barn. It's 5:30 p.m., time for the evening milking. Tonight, eight cows will be attached to automatic milking machines, and the clean tubes will carry the milk first into a large glass container in a room adjoining the barn, and then the 100 yards down to a stainless-steel tank in the milk room. Lawton wants everything to be just right. "We try to do it the same every time," she explains. "If we do it the same today as we did it yesterday, then hopefully we'll get the same result." The result she wants, of course, is clean, safe raw milk. "We're trying to make sure something we can't see doesn't get into the milk." Lawton figures that today she has 200 weekly customers, versus just a handful two years ago. This change has meant a remarkable turnaround in the fortunes of Oake Knoll Ayrshires farm, which she says had been going downhill pretty much since the Revolutionary War. Lawton family lore has it that the Foxborough farm was part of an 8-mile-long tract of land granted by the king of England to the family's forebears 13 generations ago. But because the family sided with the British in the Revolution, much of the land was lost. What did remain was passed through different branches of the family, downsizing and finally becoming a dairy in the 1980s. Today, it is only 25 acres, reached by a side street off Route 1 and located near split-level ranches and Cape-style homes. Lawton, who is 28, was introduced to dairy farming at age 4, when she was assigned a small heifer to tend. After graduating from Foxborough High School, she went to Purdue University's College of Agriculture in Indiana, where she learned during dairy classes "that milk does change when it is pasteurized," she says. Shortly after graduation, in 2003, she went to work for the state Department of Agricultural Resources as a dairy inspector and was responsible for checking out the cleanliness of about 100 dairy farms in central Massachusetts. Among them were a couple of farms licensed to sell raw milk, which piqued her interest. The idea that people would go to a farm and pay $5 or more for a gallon of milk was a revelation. Because Lawton, like many members of dairy-farming families, had grown up drinking unpasteurized milk, it had never occurred to her that it was special. In 2006, she decided to get back into the family dairy business. She investigated the raw-milk market further, learned about the growth in demand, and persuaded her parents to let her give it a try with two of the farm's 30 cows, even though selling directly to consumers was totally foreign to her. This meant not just changing the cows' diet from grain to pasture, but also learning to reach out directly to consumers rather than just pouring the milk into a tank truck. "My parents have always felt like they didn't have a choice about taking what the commodity market offers," which tends to be in the range of $1 to $2 a gallon for milk that goes to an area pasteurizing plant. "They've been helpful and supportive in terms of trying something new." Lawton has now switched eight of the herd to raw-milk production, and she's charging $8.50 a gallon for their milk. Lawton's customers are happy to pay it. Ask almost any raw-milk drinker why they would expose themselves, and their children, to the risks, and they'll tell you it's because they have complete trust in dairy farmers like Lawton. "We did a lot of research" into raw milk's safety and benefits before deciding to make it a family staple several years ago, says Lyra Maclone, a 33-year-old mom in Falmouth who has a son, 6, and a daughter, 4. "We found a trusted source in Terri." Maclone is reassured by the fact that the state conducts monthly tests of the milk produced by raw-milk dairies, including Oake Knoll, to measure bacteria levels. But, she adds, "even if they weren't testing, I would still be drinking it, because I trust her. It's wonderful to be able to get that fresh milk, and that it's coming from four or five cows, which is better than 400 or 500 cows." REGULATORS ARE NOT SO ANXIOUS TO break with convention. In Georgia, where unpasteurized milk may be legally sold only for animal consumption, agriculture authorities last summer proposed requiring all raw milk to be dyed a charcoal color, to make it unappetizing and thereby discourage human consumption. Authorities tabled the idea when raw-milk proponents packed a hearing to oppose the measure. California, which allows retail sales of raw milk, late last year passed legislation that sets a strict bacterial standard that the state's raw-milk dairies argue could significantly curtail supply; raw-milk consumers there are pushing legislation to overturn the standard. In New York and Pennsylvania, according to Gary Cox, a lawyer with the Farm-to-Consumer Legal Defense Fund based in Falls Church, Virginia, agriculture officials have been skirmishing with raw-milk dairies, seeking to curtail efforts to sell additional raw dairy products like yogurt, butter, and cream. Here in Massachusetts, both the rapid increase in consumer demand and the response of dairies switching to raw-milk production are prompting the Department of Agricultural Resources to add more safety testing. Monthly and quarterly inspections that look at overall bacterial counts will be expanded within the year to include tests for specific pathogens that can contaminate raw milk, says Assistant Commissioner Scott Soares. And while Soares sees the growing demand for raw milk as "a really important opportunity" for the state's dairies to expand revenues and profits - he thinks the number selling raw milk directly to consumers could increase to 35 over the next year or two - he stops short of ideas that go beyond simply selling more raw milk from farms that are tested more stringently. 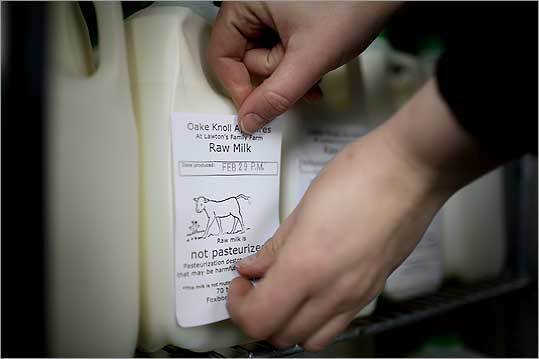 For example, Lawton says she would like to explore selling raw milk via local health-food stores if it became legal here, as it is in Connecticut and Maine. But while Soares credits Lawton with running a farm that "has gone above and beyond" the state's cleanliness guidelines, he says that Massachusetts hopes to avoid the turmoil seen elsewhere by continuing its balancing act: allowing expansion in the number of farms selling raw milk, but avoiding such potentially contentious issues as permitting retail-store sales or expanding the products allowed for sale to include raw-milk yogurt and butter. "There are risks associated with raw milk that it's our responsibility to highlight," says Soares. But he also says he'd rather "let consumers make the choice" about whether to drink it or not. In the meantime, Terri Lawton is still milking, and consumers like Valerie Walbek, the nurse from Falmouth, are still drinking. In fact, Lawton says that at least 10 of her customers, like Walbek, have become pregnant while drinking her unpasteurized milk, kept on drinking it, and have given it to their children. All of which suggest that this movement is just going to keep growing. David E. Gumpert is a freelance writer in Needham. Send comments to magazine@globe.com.